(1) Protection of the cultural and natural heritage is an inherent task for every operation US forces may conduct within its Area of Responsibility (AOR). (2) When conducting operations or undertakings, US personnel will take every reasonable precaution, consistent with the demands of mission requirements and the rules of engagement, to minimize damage to the physical artifacts and natural heritage that comprise the cultural patrimony of the peoples with its AOR. (3) While the physical artifacts of a people’s cultural and natural heritage may be irreplaceable, no artifact is worth a human life. At no time will the protection of these artifacts take precedence over the inherent and essential right of collective or individual self-defense, or the requirement to keep people from avoidable risk. (5) Manage and maintain cultural resources under DoD control in a sustainable manner through a comprehensive program that considers the preservation of historic, archaeological, architectural, and cultural values; is mission supporting; and results in sound and responsible stewards. (6) Be an international and national leader in the stewardship of cultural resources by promoting and interpreting the cultural resources it manages to inspire DoD personnel and to encourage and maintain U.S. public support for its military. (7) Consult in good faith with internal and external stakeholders and promote partnerships to manage and maintain cultural resources by developing and fostering positive partnerships with Federal, tribal, State, and local government agencies; professional and advocacy organizations; and the general public. (10) Rapidly transfer control of recognized resources to applicable responsible parties. (12) Ensure Commanders have visibility on recognized resources within their area of operations and the ability to make informed decisions on courses of action that minimize the potential for adverse impacts to those resources. 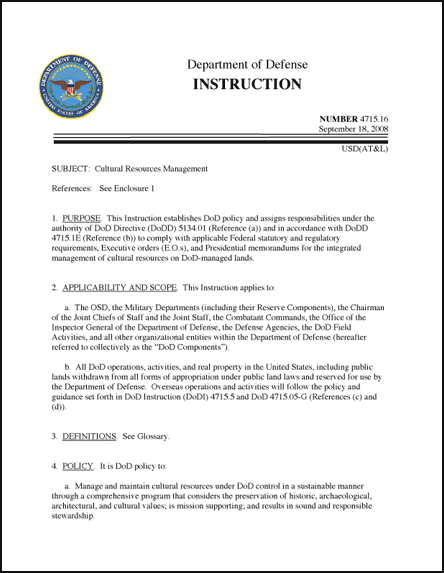 DoD policy on cultural resources management for operations, undertakings and installations inside the Continental United States (CONUS) is contained in DoD Instruction 4715.16 (dated September 18, 2008). DoD Instruction 4715.16 establishes policy and assigns responsibilities under the authority of DoD Directive (DoDD) 5134.01 [Reference (a)] and in accordance with DoDD 4715.1E [Reference (b)] to comply with applicable Federal statutory and regulatory requirements, Executive orders and Presidential memorandums for the integrated management of cultural resources on DoD-managed lands. (e) all DoD operations, activities, and real property within the United States, including public lands withdrawn from all forms of appropriation under public land laws and reserved for use by the Department of Defense. 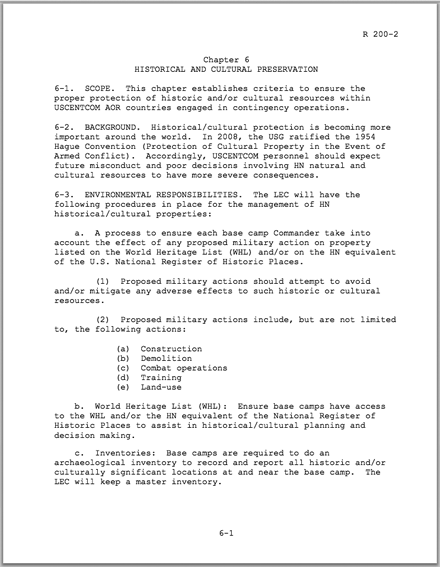 Click to view the cultural resources management policy contained in DoD Instruction 4715.16 (dated September 18, 2008). DoD operations and undertakings outside the US follow the policy and guidance set forth in DoD Instruction (DoDI) 4715.05 (dated November 1, 2013), DoD 4715.05-G (“Overseas Environmental Baseline Guidance Document” (dated May 1, 2007) [References (c) and (d)], and DODI 4715.03 (“Natural Resources Conservation Program”) (dated March 18, 2011). For more information about DoD 4715.05-G, see this page at cchag.org. Cultural Resource Policy Instructions also exist for individual DoD Service Branches. Click to view US Air Force Instruction 32-7065 (dated June 1, 2004). 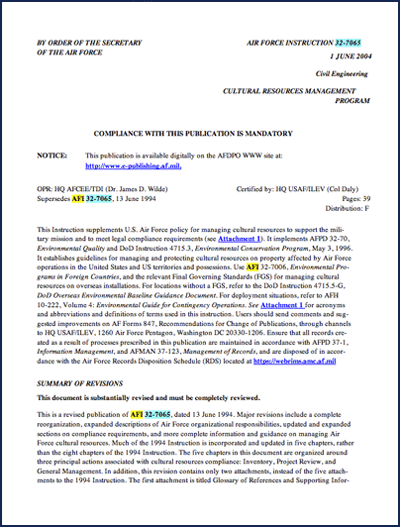 US Army Regulation 200-1 (“Environmental Protection and Enhancement”) is featured below. Click to view DoD Instruction 4715.05 (dated November 1, 2013). 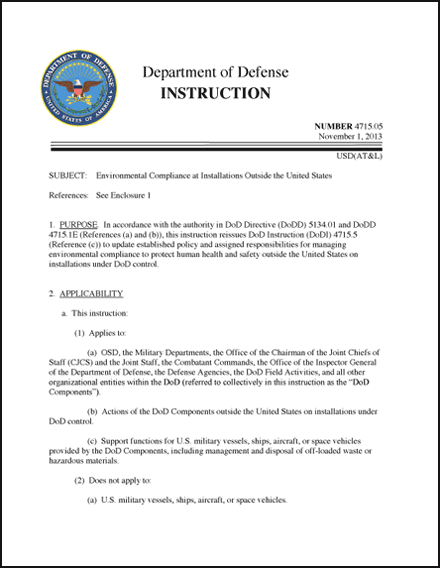 Click to view DoD Instruction 4715.05-G (the Overseas Environmental Baseline Guidance Document) (dated May 1, 2007). Instructions for managing historical and cultural resources are contained in Chapter 12, pages 110-112. DoD policy mandates that cultural resources preservation requirements be incorporated into mission activities. Accordingly, individual Combatant Commands have developed environmental regulations that include protection of cultural property within the Combatant Command’s AOR. For example, see USCENTCOM Regulation R-200-2. Joint Forces that support Combatant Commands outside the United States (OCONUS) have also developed environmental regulations and guidelines for cultural resource preservation. A best-in-class example was created by US Army Africa (USARAF). 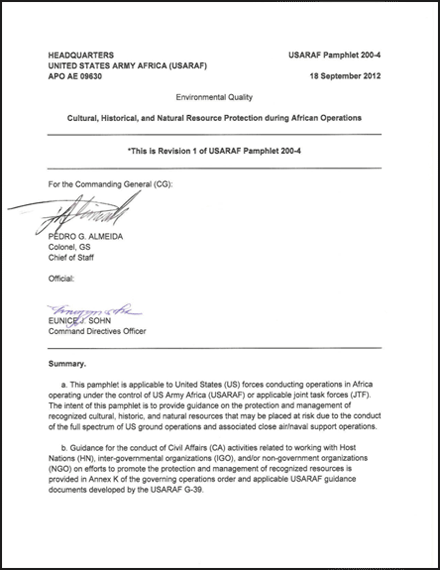 See the revised 42-page USARAF Pamphlet 200-4 “Environmental Quality: Historical, Cultural and Natural Resource Protection during African Operations (dated September 18, 2012). For bases and installations within the continental United States (CONUS), DoD is required by Federal laws and its own regulations to provide appropriate management of the cultural resources that are present on the installation or base. These Federal laws include requirements for the preservation of historic properties and archaeological sites, requirements that Native American remains and sacred artifacts are treated in a manner agreeable to native tribes, and preservation of the rights of Native Americans to exercise traditional religious practices, which includes allowing access to sacred places located on Federal property, pursuant to the Native American Graves Protection and Repatriation Act of 1990 (25 USC 3001-3013), commonly known as NAGPRA. Accordingly, Joint Forces have also established regulations for protection and enhancement of the environment, including cultural resources, on military lands in the United States. For example, the environmental regulation adopted by the Department of the Army — Chapter 6 of the AR 200-1 (“Environmental Protection and Enhancement”) — establishes policies for the incorporation of cultural resources management into mission activities. AR 200-1 directs each installation to prepare an Integrated Cultural Resources Management Plan (ICRMP), which is used to ensure installation compliance with Federal laws for cultural resources. For a best-in-class example, see the 2012-2017 ICRIMP developed for the US Marines base at Camp Lejeune. 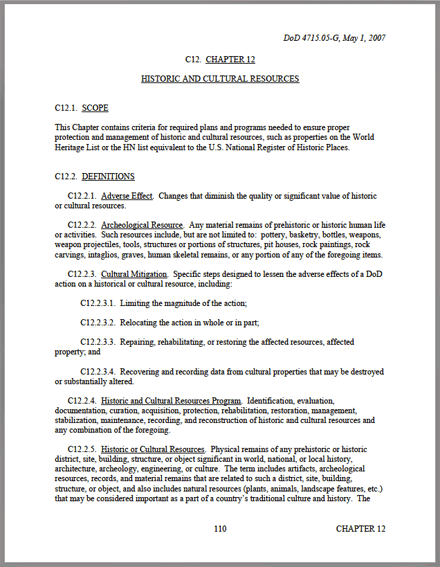 Click to view and download Chapter 6 [“Historical and Cultural Preservation”] of the USCENTCOM Contingency Environmental Guidance: Environmental Regulation (R 200-2). 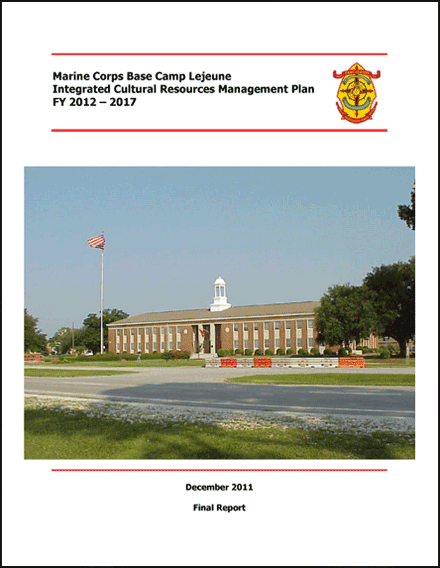 Click to view the 2012-2017 ICRIMP prepared for the US Marines base at Camp Lejeune. Click to view the USARAF Pamphlet 200-4 “Environmental Quality: Historical, Cultural and Natural Resource Protection during African Operations (dated September 18, 2012). 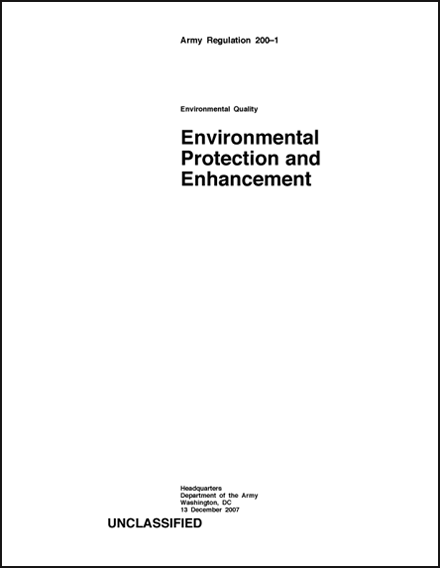 Click to view the full text of Army Regulation 200-1 (“Environmental Protection and Enhancement”). The purpose of the ICRMP is to provide sufficient information for cultural resources management to make informed decisions with background information and guidance regarding cultural resources, including historical context, laws, and regulations. The ICRMP provides a management plan that reflects goals and objectives for the installation cultural resources program. The ICRMP should be an integral part of any base or installation; therefore, cost-effective, integrated strategies for mission support are required. The ICRMP should integrate the entirety of the installations cultural resources program with ongoing mission activities, allow for the ready identification of potential conflicts between the installation‟s mission and the cultural resources management program, and identify Federal compliance actions necessary to maintain the mission-essential installation properties and acreage. A properly prepared ICRMP will help ensure that the legal requirements for historic preservation are identified and addressed during the planning and implementation of military operations, construction and other mission-essential activities. Click to view DoD Cultural Resources Policy Instructions inside the United States. Click to view DoD Cultural Resources Policy Instructions outside the United States. Read the latest issue of “DoD Cultural Resources UPDATE,” a quarterly newsletter sponsored by the Department of Defense Cultural Resources Program. DoD operations and undertakings outside the US follow the policy and guidance set forth in DoD Instruction (DoDI) 4715.05 (dated November 1, 2013), DoD 4715.05-G (“Overseas Environmental Baseline Guidance Document” (dated May 1, 2007) [References (c) and (d)], and DODI 4715.03 (“Natural Resources Conservation Program”) (dated March 18, 2011). For more information about DoD 4715.05-G, see this page. Cultural Resource Policy Instructions also exist for individual DoD Service Branches. Click to view US Air Force Instruction 32-7065 (dated November 19, 2014). The purpose of General Order 1 is to identify conduct that is prejudicial to the maintenance of good order, optimal readiness and discipline of all forces and select civilians assigned to the Area of Responsibility (AOR) for which the General Order has been issued. Each Combatant Commander either affirms the pre-existing General Order 1 or issues a new General Order 1 upon assuming command. General Order 1 is applicable to all DoD personnel, US Coast Guard personnel, and certain other interagency personnel (while TACON to DoD), including certain contractors operating within the AOR of the COCOM that issues the order. General Order 1 stipulates in Paragraph 3 that all prohibitions described in Paragraph 2 are punitive. USCENTCOM General Order 1. On 21 May 2013, the Commander in Chief of USCENTCOM, General Lloyd J. Austin, III, rescinded General Order 1B (GO-1B), dated 13 March 2006, and all waivers granted pursuant to GO-1B, and issued General Order 1C (GO-1C), which remains in force for all CENTCOM personnel serving in the Iraq and Afghanistan Theater of Operation. USSOUTHCOM General Order 1. On 28 May 2012, SOUTHCOM Commander U.S. Air Force General General Douglas M. Fraser rescinded all previous General Orders and all waivers granted pursuant to previous General Orders and issued General Order Number 1 (GO-1), which remains in force for all DoD personnel and related parties, as described in the Order, serving in the SOUTHCOM AOR. 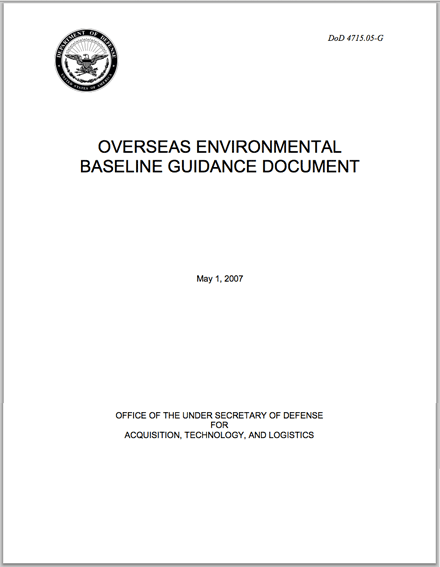 The Overseas Environmental Baseline Guidance Document (OEBGD) comprises a set of objective criteria and management practices developed by DoD to update established policy and assigned responsibilities for managing environmental compliance to protect human health and safety outside the United States on installations under DoD control. Important guidance with respect to cultural resource protection is contained in Chapter 12 of the OEBGD. or situations in which U.S. forces operate as part of a multinational force not under full U.S. control. “a. DOD manages and applies installation assets to sustain the DOD national defense mission; uses environmental, safety, and occupational health management systems in mission planning and execution across all military operations and activities; and ensures all organizations plan, program, and budget to manage the environmental, safety, and occupational health risks that their activities generate in accordance with Reference (b). Click to view the full text of the Overseas Environmental Baseline Guidance Document. In addition: “d. A program for regular assessment of environmental compliance at installations outside the United States is established and conducted by DoD Components. This Chapter contains criteria for required plans and programs needed to ensure proper protection and management of historic and cultural resources, such as properties on the World Heritage List or the Host Nation (HN) list equivalent to the U.S. National Register of Historic Places. C12.2.1. Adverse Effect. Changes that diminish the quality or significant value of historic or cultural resources. C12.2.2. Archeological Resource. Any material remains of prehistoric or historic human life or activities. Such resources include, but are not limited to: pottery, basketry, bottles, weapons, weapon projectiles, tools, structures or portions of structures, pit houses, rock paintings, rock carvings, intaglios, graves, human skeletal remains, or any portion of any of the foregoing items. Click to view chapter 12 [“Historical and Cultural Resources”] of the Overseas Environmental Baseline Guidance Document. C12.2.3.4. Recovering and recording data from cultural properties that may be destroyed or substantially altered. C12.2.4. Historic and Cultural Resources Program. Identification, evaluation, documentation, curation, acquisition, protection, rehabilitation, restoration, management, stabilization, maintenance, recording, and reconstruction of historic and cultural resources and any combination of the foregoing. C12.2.5. Historic or Cultural Resources. Physical remains of any prehistoric or historic district, site, building, structure, or object significant in world, national, or local history, architecture, archeology, engineering, or culture. The term includes artifacts, archeological resources, records, and material remains that are related to such a district, site, building, structure, or object, and also includes natural resources (plants, animals, landscape features, etc.) that may be considered important as a part of a country’s traditional culture and history. The term also includes any property listed on the World Heritage List or the HN equivalent of the National Register of Historic Places. HN lists of properties should be evaluated to determine if they are equivalent with the National Register of Historic Places prior to application. C12.2.6. Inventory. To determine the location of historic and cultural resources that may have world, national, or local significance. C12.2.7.10. Any portion or piece of any of the foregoing. C12.2.8. Preservation. The act or process of applying measures to sustain the existing form, integrity, and material of a building or structure, and the existing form and vegetative cover of a site. It may include initial stabilization work where necessary, as well as ongoing maintenance of the historic building materials. C12.2.9. Protection. The act or process of applying measures designed to affect the physical condition of a property by safeguarding it from deterioration, loss, attack, or alteration, or to cover or shield the property from danger or injury. In the case of buildings and structures, such treatment is generally temporary and anticipates future historic preservation treatment; in the case of archaeological sites, the protective measure may be temporary or permanent. C12.3.1. Installation commanders shall take into account the effect of any action on any property listed on the World Heritage List or on the applicable country’s equivalent of the National Register of Historic Places for purposes of avoiding or mitigating any adverse effects. C12.3.2. Installations shall have access to the World Heritage List and the HN equivalent of the National Register of Historic Places. C12.3.3. Installation commanders shall ensure that personnel performing historic or cultural resource functions have the requisite expertise in world, national, and local history and culture. This may be in-house, contract, or through consultation with another agency. Government personnel directing such functions must have training in historic or cultural resources management. C12.3.4. Installations shall, after coordination with the HN installation commander or similar appropriate HN authorities, prepare, maintain, and implement a cultural resources management plan that contains information needed to make appropriate decisions about cultural and historic resources identified on the installation inventory, and for mitigation of any adverse effects. C12.3.5.1. Inventory historic and cultural resources in areas under DoD control. An inventory shall be developed from a records search and visual survey. C12.3.5.2. Establish measures sufficient to protect known historic or cultural resources until appropriate mitigation or preservation can be completed. C12.3.5.3. Establish measures sufficient to protect known archeological resources until appropriate mitigation or preservation can be completed. C12.3.6. Installation commanders shall establish measures to prevent DoD personnel from disturbing or removing historic or cultural resources without permission of the host nation. C12.3.7. Installation commanders shall ensure that planning for major actions includes consideration of possible effects on historic or cultural resources. 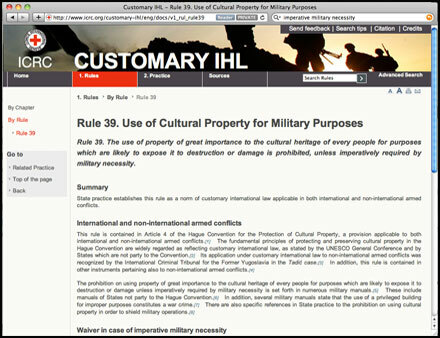 The 1954 Hague Convention for the Protection of Cultural Property in the Event of Armed Conflict is the principal international treaty that sets forth obligations and provisions for the protection of cultural property during military operations. 1. With 126 States Parties and four state signatories to date, the 1954 Hague Convention is considered customary international law. This means all nations as well as non-state actors are bound by the terms of the Convention. Violations can be prosecuted under international law, whether the accused party signed/ratified the Convention or not. 2. 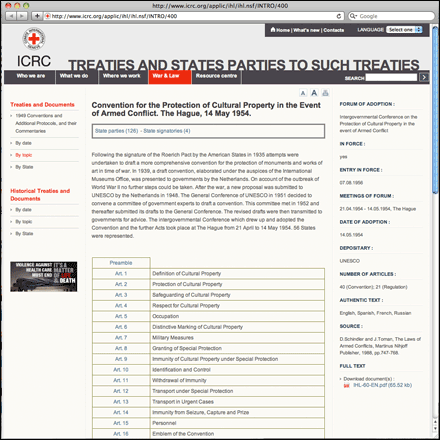 Under the terms of the Convention, all States Parties must protect the cultural property situated within their own territory and avoid acts of hostility directed against another State Party’s cultural property, defined broadly to include historic structures and monuments, archaeological sites, and repositories of collections of artistic, scientific and historical interest. Should not target, attack or direct any act of hostility against the cultural property of another nation. Should not use cultural property in a way that might expose it to destruction or damage during hostilities. Should not direct any act of reprisal against cultural property. These obligations may be waived only in cases where military necessity imperatively requires such a waiver. What is “imperative military necessity? Who decides whether “imperative military necessity” exists? Who who decides if a cultural property on a “no strike” list is to be attacked? 5. Article 5 of the Convention sets out the obligations of a State Party during occupation, emphasizing that the primary responsibility for securing cultural property lies with the competent national authority of the State that is being occupied. Therefore the first obligation imposed on the occupying power is to support these national authorities as far as possible. But the obligation of the occupying power to care for and preserve the cultural property of the occupied territory is limited. 6. Article 6, Article 10, Article 12, Article 16 and Article 17 of the Convention define usage of the “Blue Shield” emblem. These Articles collectively state that immovable cultural property, or vehicles / repositories / persons responsible for the transport or protection of such property, or persons engaged in the regulation of the Convention may be marked with the “Blue Shield”, indicating that the property, vehicles, repository or persons responsible for safeguarding these assets are subject to official protection. See sidebar to the left. 7. Article 7 of the Convention requires that States Parties undertake to educate their military about the Convention. States Parties shall undertake to plan or establish in peacetime, within their armed forces, services or specialist personnel whose purpose will be to secure respect for cultural property and to co-operate with the civilian authorities responsible for safeguarding it. Article 7 also requires States Parties to introduce regulations concerning observance of the Convention. The COCOM regulations, NATO regulations and General Order One, which comply with these Hague ’54 requirements and other international treaties, can be found elsewhere in this website by clicking the appropriate links. Click to review the definition of “military necessity” as found in Customary International Law Rule 39, which was clarified in the Second Protocol to the 1954 Hague Convention. A waiver based on “imperative military necessity” must be decided at an appropriate level of command, and the waiver has strict limits. For example, under Article 53(2) of Additional Protocol I and Article 16 of Additional Protocol II of the Geneva Conventions, there is no military necessity waiver that permits anyone to attack or make military use of “historic monuments, works of art or places of worship which constitute the cultural or spiritual heritage of peoples”. In other words, world-class sites are strictly off-limits. Some (but not all) of these properties are found on The World Heritage List. 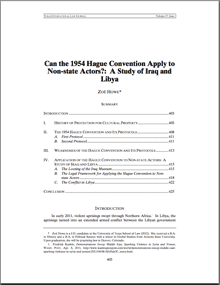 Click to read “Can the 1954 Hague Convention Apply to Non-state Actors? : A Study of Iraq and Libya,” by Zoë Howe (Texas International Law Journal, Spring, 2012). 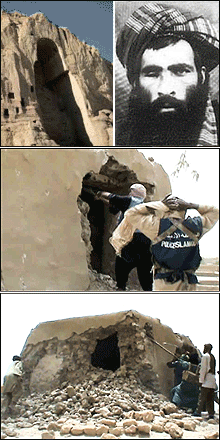 The 2001 destruction of the Bamiyan Buddhas (top photo), ordered by the Afghan Taliban leader Mullah Omar, and the 2012 destruction of Sufi tombs at Timbuku (middle and lower photos) by Islamist fighters associated with Ansar Dine, were clear violations of the 1954 Hague Convention by non-state actors and are subject to prosecution at the International Tribunal in the Hague. 6. Article 6, Article 10, Article 12, Article 16 and Article 17 of the Convention define usage of the “Blue Shield” emblem (click for enlarged view). These Articles collectively state that immovable cultural property, or vehicles / repositories / persons responsible for the transport or protection of such property, or persons engaged in the regulation of the Convention may be marked with the “Blue Shield”, indicating that the property, vehicles, repository or persons responsible for safeguarding these assets are subject to official protection. See sidebar to the left. DoD’s cultural resources policy and environmental regulations require that all operations and undertakings comply with the terms of The Convention Concerning the Protection of the World Cultural and Natural Heritage, commonly known as the 1972 World Heritage Convention. The purpose of the Convention is to identify and conserve sites and properties of outstanding cultural or natural importance to the common heritage of humanity and catalogue these properties and sites in an internationally recognized list known as The World Heritage List. DoD compliance with the 1972 World Heritage Convention is enforceable under Title 16 U.S. Code § 470A-1, which includes a 1980 amendment to the National Historic Preservation Act, incorporating the 1972 World Heritage Convention into U.S. Law. (3) consider alternatives to mitigate such effect. The United States initiated the idea of identifying and conserving cultural and natural properties of outstanding importance at a White House conference held in 1965, which called for a ‘World Heritage Trust’ to preserve “the world’s superb natural and scenic areas and historic sites for the present and the future of the entire world citizenry.” This proposal and similar initiatives, such as the International Union for Conservation of Nature (source), were presented to a United Nations conference on Human Environment held in Stockholm in 1972. Final text of the Convention was adopted by the General Conference of UNESCO on 16 November 1972. To date, 190 states party have signed or ratified the Convention, making it one of the most widely accepted of all international instruments. Only Liechtenstein, Somalia, South Sudan, the Bahamas, Nauru, Timor-Leste and Tuvalu are not Party to the Convention. 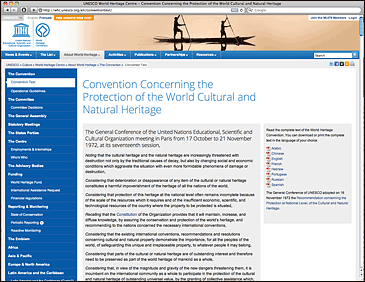 Click to view the official text of the 1972 World Heritage Convention. Courtesy: UNESCO. Every COCOM AOR includes World Heritage List properties, which must be protected pursuant to the 1972 World Heritage Convention. MilCHAG offers one-click access to the 981 World Heritage List properties around the world. Procedures must be in place to avoid causing direct and adverse effects to World Heritage List properties during DoD operations or undertakings. The map below provides links to the UNESCO database of cultural heritage laws and contains information that may be used only for educational, research and other non-commercial purposes, on condition that any use or reproduction of the data cites the UNESCO World Heritage Centre © UNESCO All rights reserved. Disclaimer Relating to Host Nation Laws: It is the responsibility of each Member State to make available to the United Nations Educational, Scientific and Cultural Organization (UNESCO), in the most accurate and up-to-date form possible, the laws in force, applicable import/export certificates, contact details for the competent national authorities and the full address of the official websites dealing with protection of the cultural heritage. In case any of this information changes, the Member State concerned will endeavor to provide UNESCO with the new version to enable UNESCO to update its website. It should be noted that the Database contains current cultural heritage laws submitted by UNESCO Member States. It may not, however, contain all earlier legislation and regulations on which a country may rely and which may have claimed ownership by the country of origin of cultural objects or regulated their export. Therefore, additional research or contact with the national authorities of the source country may be necessary to determine the legal status of specific objects. To facilitate the use of the database of host nation laws, the UNESCO Secretariat has provided informal, unofficial translations where necessary of the titles of the laws submitted, simply in order to enable the identification of the subject matter of the law. These unofficial translations, preceded by “*”, may not be cited or reproduced. This page provides links to the UNESCO Database of Cultural Heritage Laws and 981 UNESCO World Heritage List properties that are protected under the terms of the 1972 World Heritage Convention. Before approving any DoD operation or undertaking, the Secretary of Defense or his designee in the OSD must: (1) take into account and have a procedure to determine whether the operation or undertaking will have an adverse effect to a UNESCO World Heritage List property; (2) give notice of such effect; and (3) consider alternatives to mitigate such effect, as required by the National Historic Preservation Act Amendments of 1980 (Public Law 95-919), under Title IV (“International Activities and World Heritage Convention”), Section 402. This MilCHAG map links to information that may be used only for educational, research and other non-commercial purposes, on condition that any use or reproduction of the data cites the UNESCO World Heritage Centre © UNESCO All rights reserved.